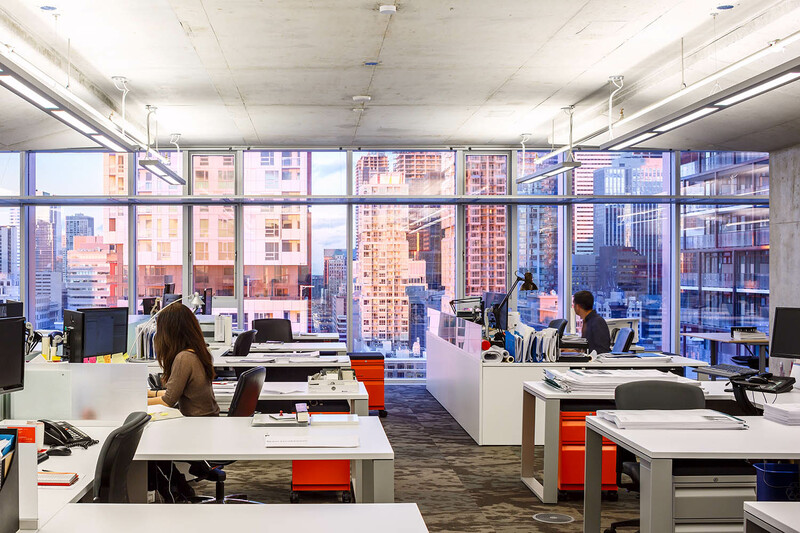 It is a privilege for most architects to work in a building they themselves designed. Therefore, when the chance came to move our office to Queen Richmond Centre West, it was an opportunity we couldn't pass up. Leaving the King West brick-and-beam charm was hard, but after a decade it was time to make a move into the progressive space of the future. The design intent for our office was to create a functional place for our diverse team that was flexible to support the different ways people work and move, and to be a model open office environment we could tour clients and collaborators through. The office is designed as two major zones, one public and the other private. As you enter the lobby area you are immediately greeted with a bright and open atmosphere, with uninterrupted north and east views of the city. In the middle is a custom millwork reception desk, with modular sectionals distributed throughout the lobby that operate as a lounge for guests and clients who come for meetings. 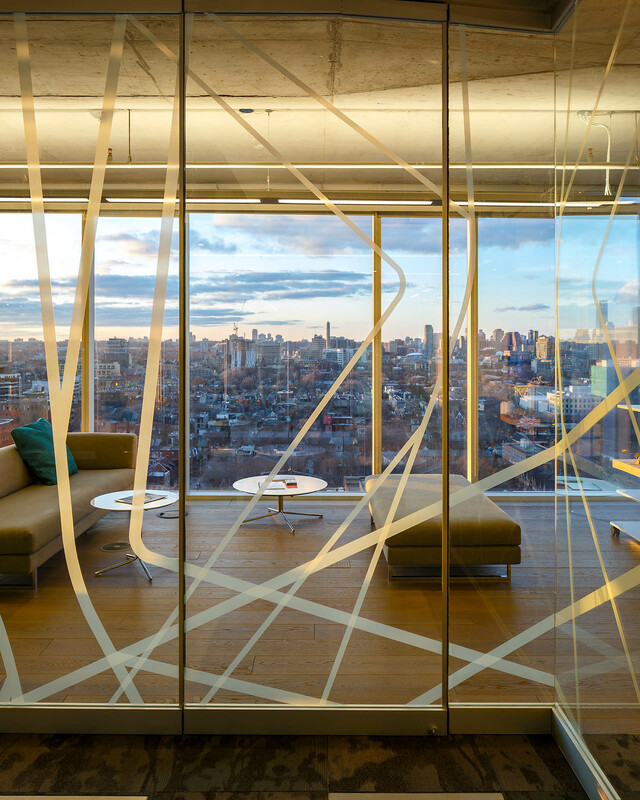 The lobby is surrounded by boardrooms and private administrative offices, enclosed in glass for transparency to light and views and approachability to visitors and staff. The boardrooms separate the public and private zones, with entrances providing access to either sides. 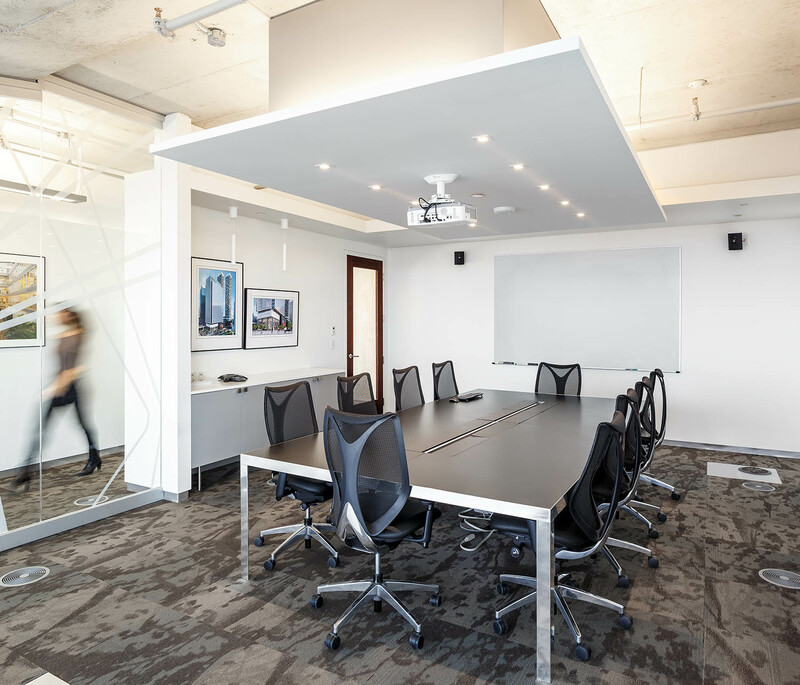 Both boardrooms are equipped with multiple display surfaces (magnetic, whiteboard, and video), custom credenzas for storage and counter space, and large fixed tables with power, data, and communications. 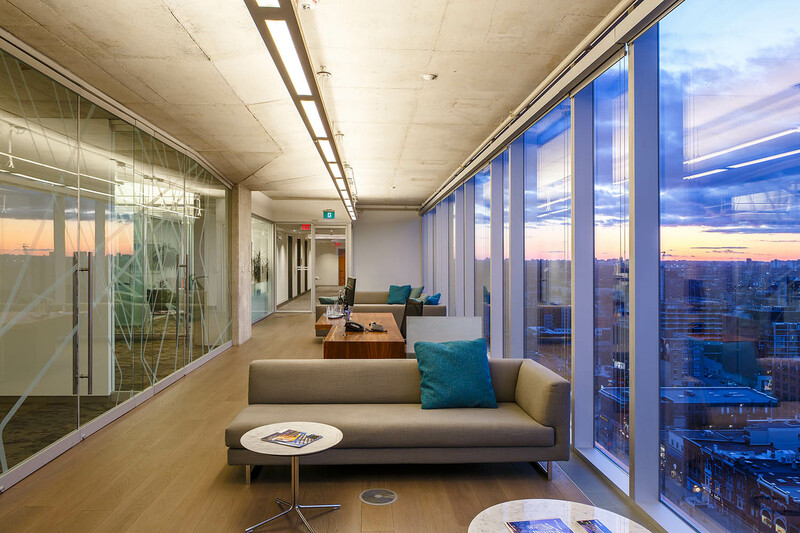 The glass walls towards the lobby swing open fully to provide spill out space into the lounge area when the boardrooms are used for larger assemblies. 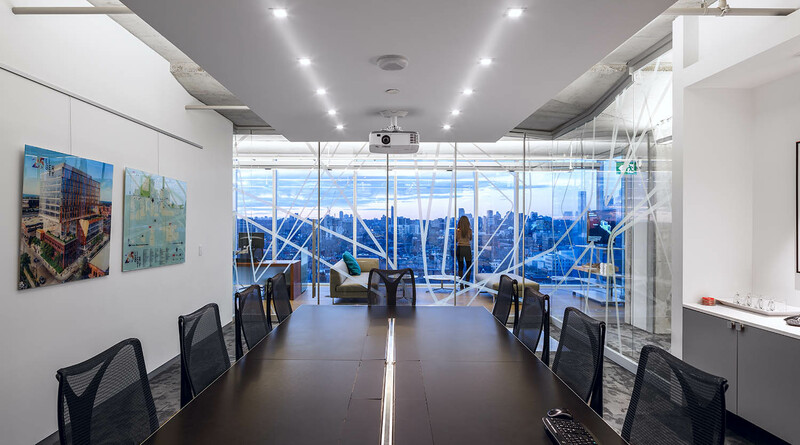 Straddling the space between the public and private zones is a smaller meeting room, aptly named the Fishbowl because of its 3-sided glass enclosure with privileged north-east views, and Dermot Sweeny's office. Past the boardrooms, the main space opens up to reveal the more private and secluded, yet expansive zone of the office. This is where the majority of the team works. 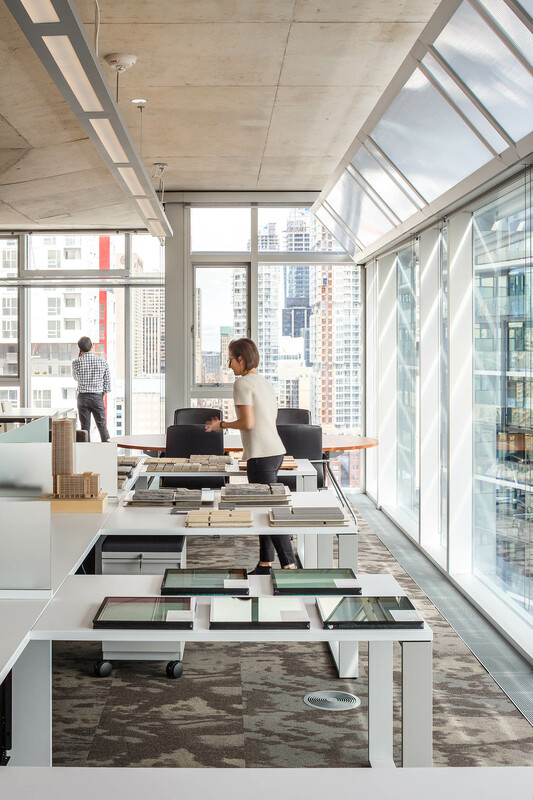 To foster the studio mentality, an open office with rows of designated workstations promote both focused work and meaningful interaction and collaboration among teammates. Work stations are positioned the closest to the windows, while ancilliary rooms for printing, private phone calls and tall cabinets for storage are located away from studio windows, closest to the elevator core and the exits. The office kitchen is in the most south-west corner of our office space. 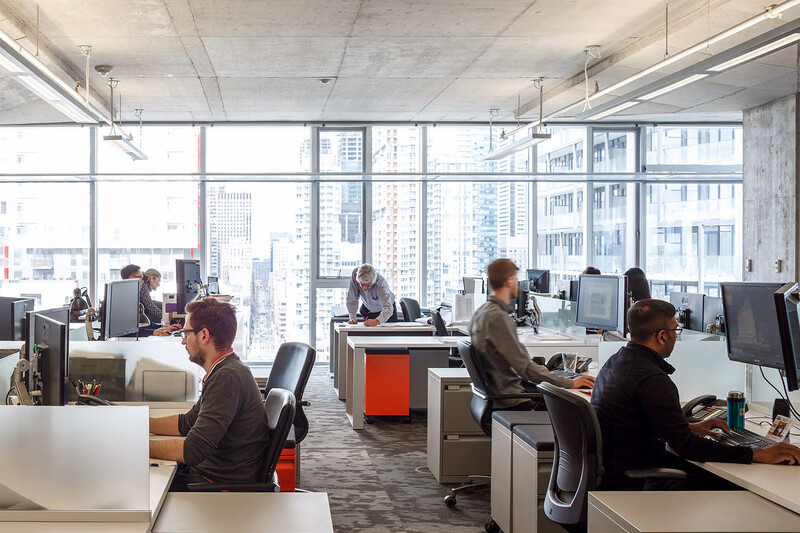 It is located farthest away from the reception and boardroom areas to mitigate noise and optimize internal privacy for the team to enjoy their lunch and break times. The kitchen, which serves the entire office, has become the hub and centerpiece for employees' daily interactions. The highly functional kitchen was designed to maximize access to kitchen facilities with minimum disruption to those enjoying their meals. The kitchen appliances are positioned together on the north wall. 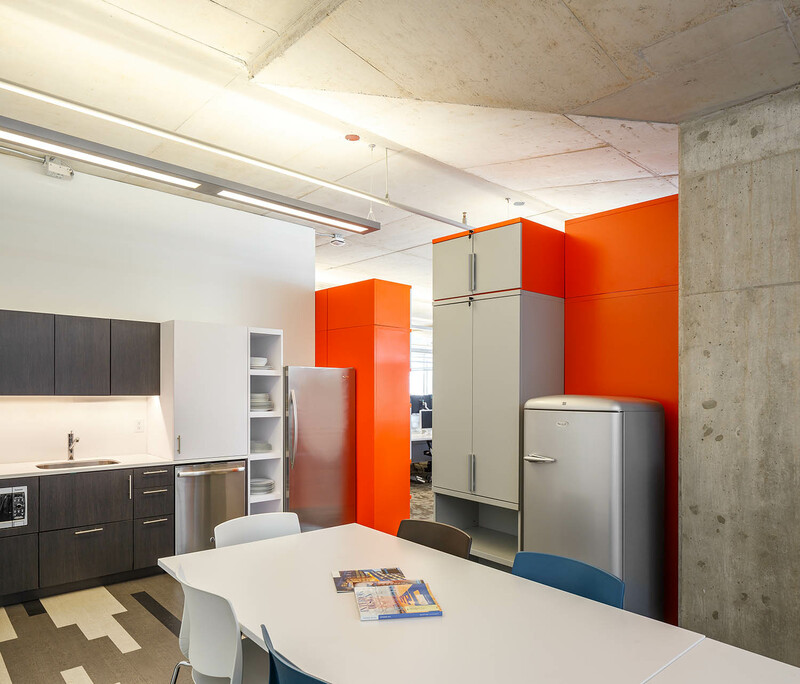 Storage shelving and counter space follows the East wall down, dividing the kitchen from the rest of the open office. A large community table that comfortably accomodates 16 people stretches out to the south windows with great views of the city and Lake Ontario. 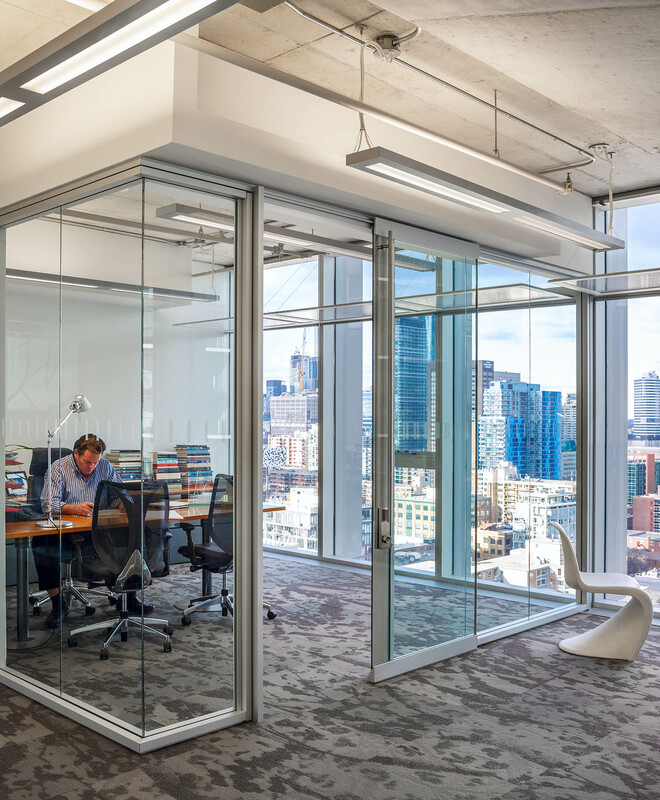 Attention to the individual experience is apparent as every workstation, boardroom, office, kitchen and meeting space has access to natural light, expansive views out, and all the benefits our raised floor system has to offer. Personal air diffusers provide every workstation and enclosed room with ample fresh air and the ability to control your own temperature for optimized comfort. Adding to that, fresh air can be supplemented via any of the operable windows at any given time. 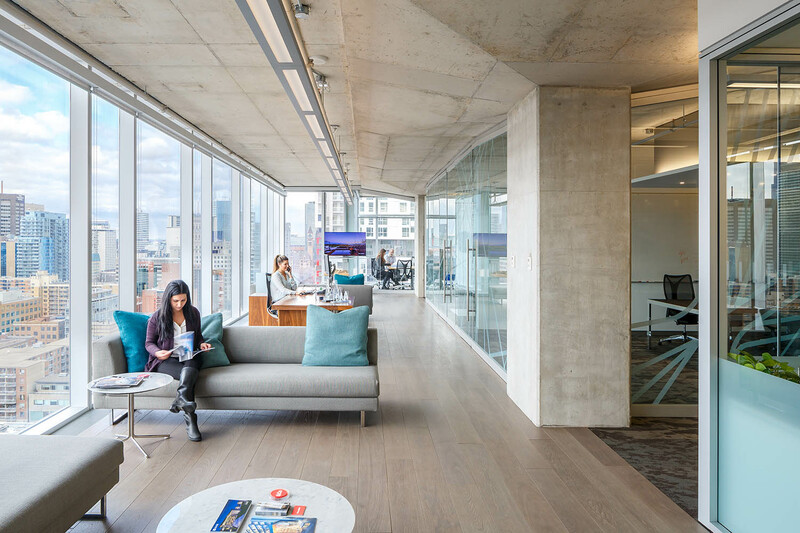 The result is a space we are proud to showcase to our clients, and a true example of what an office in an award-winning building with raised floors can look like.